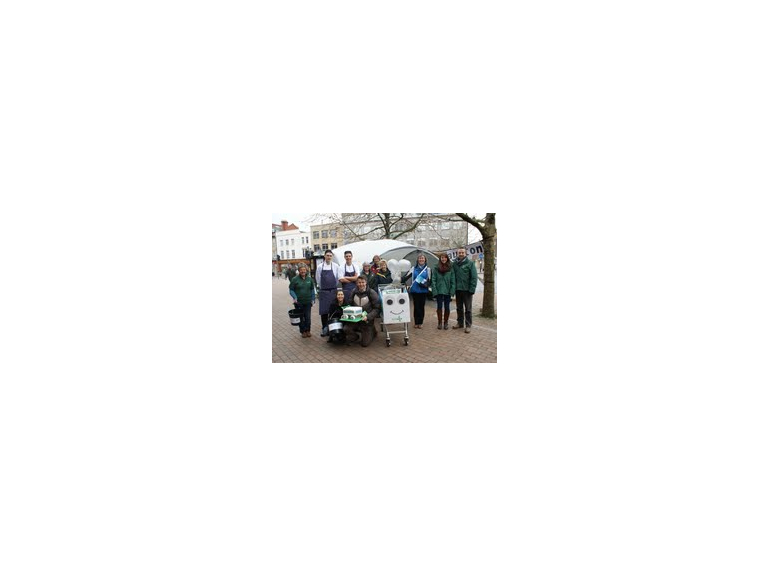 People in Taunton generously gave £270 to Taunton Foodbank last week when they hosted a Trolley Push fundraising event in the town centre, but they are still short of their £500 target. The Foodbank trolley, like the Olympic torch, has started to make its way around the UK, visiting 50 Foodbank locations and covering more than 2,300 miles. The Trolley Push started in Salisbury on Monday 8th April and arrived in Taunton on Tuesday 9th April. People guessed how much food had been given out since opening, sponsored food baskets, donated money and even had the chance to win a meal for two at The Castle Hotel (Brazz). People also had the chance to see how Matt Buckley, Sous chef from the Castle Hotel had prepared a delicious meal using the ingredients from an emergency food parcel and also got to taste a piece of cake in the shape of a shopping trolley. Keith Whittaker from Taunton Foodbank said “We were amazed at the generosity of people from Taunton who helped us half way to our £500 target. It was great to see how Matt Buckley from the Castle Hotel turned ordinary tinned food into a delicious meal just by adding a few spices.” Keith added “We are still £230 short of our target and would like people to sponsor a food box that is used for safe and easy storage as well as transportation of food that has been donated. You can sponsor each box for £3 and we will place your name on the box for the next year. “ Keith said “The Foodbank has seen a significant increase in the need for emergency food parcels and anticipate a further increase as the Welfare Reforms take effect”. “Thanks to Falcon Van Hire and our team of volunteers, we moved to a new warehouse this month. We had to run down our food stocks to make the move easier. However food levels are now very low and we will be having a food collection at a supermarket in the very near future. In the meantime people can contact us if they want to donate food before then so we can continue to provide emergency food to those in need.